In this thrilling sequel to The Stonekeeper, Emily and her brother, Navin, head for Kanalis, a beautiful and mysterious city of waterfalls, where they hope to find the antidote for the poison that has sickened their mother. It's up to Em to triumph over evil while controlling the... read full description below. 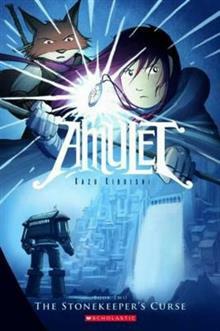 In this thrilling sequel to AMULET #1: THE STONEKEEPER, Emily and her brother Navin head for Kanalis, a beautiful and mysterious city of waterfalls, where they hope to find the antidote for the poison that felled their mother. That cure lies in the eggs of a giant serpent atop Demon's Head Mountain, but the kids' archenemy, Trellis, is headed for the peak, too. A battle that will engulf all of Kanalis is looming. It's up to Em to triumph over evil while controlling the amulet's power . . . without losing herself!